Rodeos are fun-filled, hands-on training events that focus on introducing elementary and middle school students* to safe bicycle handling skills and safe riding techniques for on-the-road riding. The training incorporates bicycle handling drills and a simulated city streets course where students learn proper starting and stopping technique, hand signaling, how to fit a helmet, how to perform bicycle safety checks, how to ride in a straight line and how to ride safely and predictably. The course is taught by a team of experienced bike safety educators. The program is delivered in-class for 4th, 5th and 6th graders. After-school and weekend rodeos that are open to students in grades K-8 are also available. Bike Rodeos can be scheduled Monday-Saturday from September 2018 through June 2019. 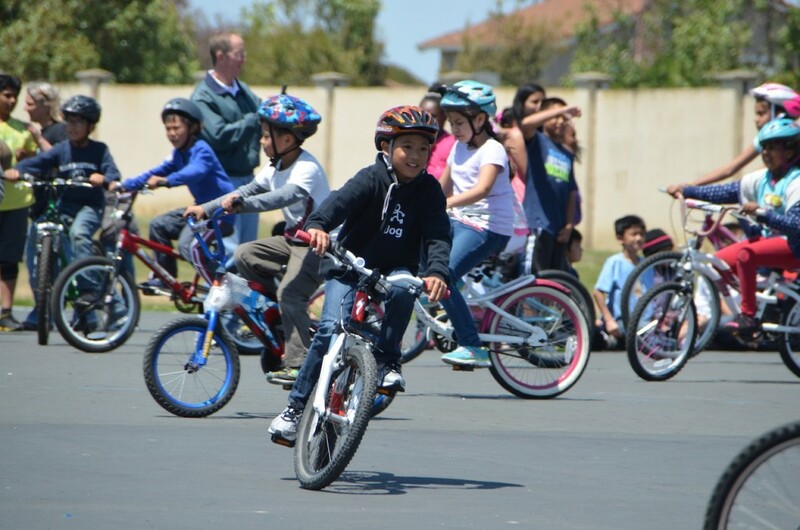 Please fill out the Bike Rodeo Request Form to request your school’s bicycle rodeo. For questions, please contact Loke Davis at bike.ed@alamedacountysr2s.org. *Excludes 7th and 8th grades. For programming for 7th and 8th grade students, please check out our Drive Your Bike program.